Benchtop Logger (MSCL-XZ) – Geotek Ltd.
Geoscan V linescan core imaging. X-ray photons excite electrons in the sediment, releasing characteristic X-rays for each element which are collected through either an Olympus Delta handheld X-ray fluorescence (XRF) or an ultra-sensitive Geotek XRF spectrometer. The selection of the XRF sensor determines whether a cabinet will be required. 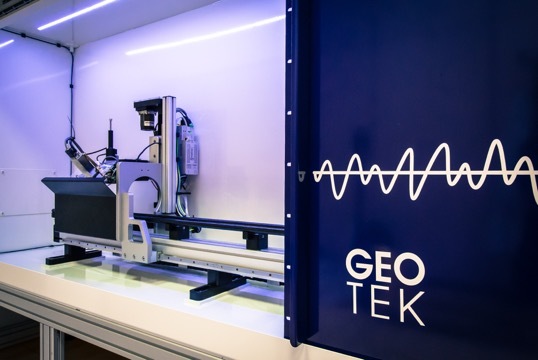 The Geotek ultra-sensitive XRF sensor requires the cabinet and is purpose-designed with a helium-flushed measurement cell to detect low energy elements such as Mg, Si and Al. The Olympus Delta handheld does not require a cabinet and can be detached from the instrument and used as a portable handheld if required. Elemental analyses can be used directly in environmental studies or indirectly as proxies for changes in mineralogy. Reflectance spectra are collected in 39 spectral bands by a Minolta colour spectrophotometer to provide accurate colour data, including Munsell representations. The spectrophotometer is calibrated internally by using a white calibration reference tile and a zero-reflectance, “free-air” reading. True sediment or rock colour prior to core oxidation is a valuable correlation parameter for ore mineralogy, sedimentology, and climate research. Geotek has integrated an ASD LabSpec Analyser into the MSCL-XZ, which includes a high intensity contact probe that comes into contact with the sample to be measured. The sample is illuminated by the integral halogen light source through a fibre optic link. The spectrometer returns data from 350-2500 nm which is collected and displayed in the MSCL software alongside any other data. 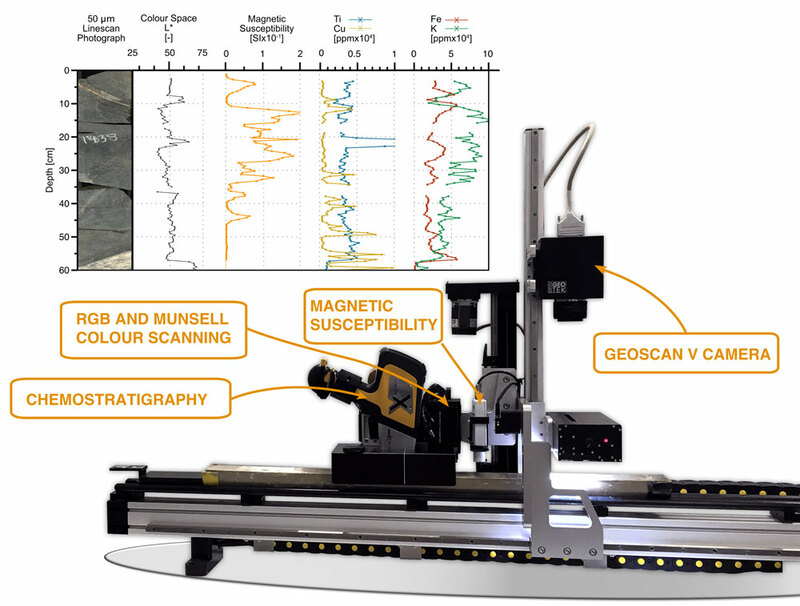 Split-core inductive measurements of magnetic susceptibility are made with a Bartington MS2E “point” sensor that provides high down-core spatial resolutions. The active portion of the sensor is a narrow rectangle, oriented across the core, that has a field of influence of approximately 5mm. The accuracy of the sensor is assessed using a custom check piece from the manufacturer. Magnetic susceptibility, a dimensionless number, is reported in SI units with an accuracy typically of ±4%. Changes in magnetic susceptibility correlate with changes in sedimentary provenance and/or diagenetic environment. Data acquisition rates are highly dependent on the user setup and the sampling interval. XRF measurements are especially variable, with 15-120 second count times, depending on the accuracy desired. A typical scan with all sensors (30 second XRF data acquisition) at 2 cm intervals would enable about 50 m of core to be processed through a laboratory per day.